Every Sunday I remember waking up to the smell of pancakes on the griddle. My mom was a pancake expert, churning out piles of perfectly round, golden-brown, pillowy masterpieces. We switched up the toppings every week – sometimes it was fresh Wisconsin maple syrup, other times we stuck with savory, Aussie Vegemite. One of my favorites was lemon juice with granulated sugar – a bit of tart and sweet in one bite. My family loved pancakes so much that we begged for leftovers to eat for breakfasts through the week. My sisters and I even gave her a griddle one year as a self-serving gift so she could make us more pancakes. When we came home from college, mom would send us back with bags of frozen pancakes. Occasionally I’ll pull out her pancake recipe. 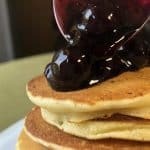 I’ll never make them as perfectly as my mom, but these pancakes with blueberry sauce still bring back fond memories of Sunday mornings with the family. Start with the blueberry sauce. 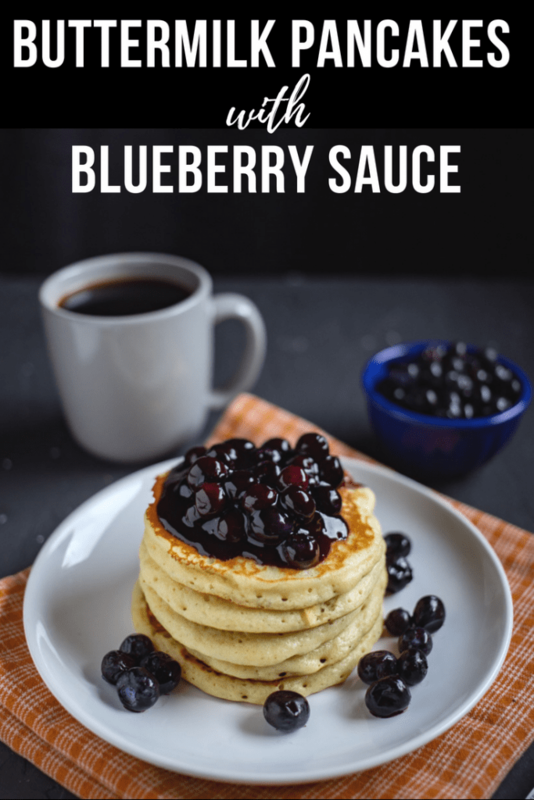 You’ll add the blueberries in two batches to allow the first batch to develop flavor and to keep the texture of the blueberries in the second. First add blueberries, water, and sugar to the pan and bring to a boil. Then you’ll add dissolved cornstarch to thicken the mixture. Finally, add the second batch of blueberries and heat through. Remove from heat and set aside. After the blueberry sauce is done, you can start on the pancakes. You’ll first mix all of the dry ingredients together, then add the egg, oil, and buttermilk. 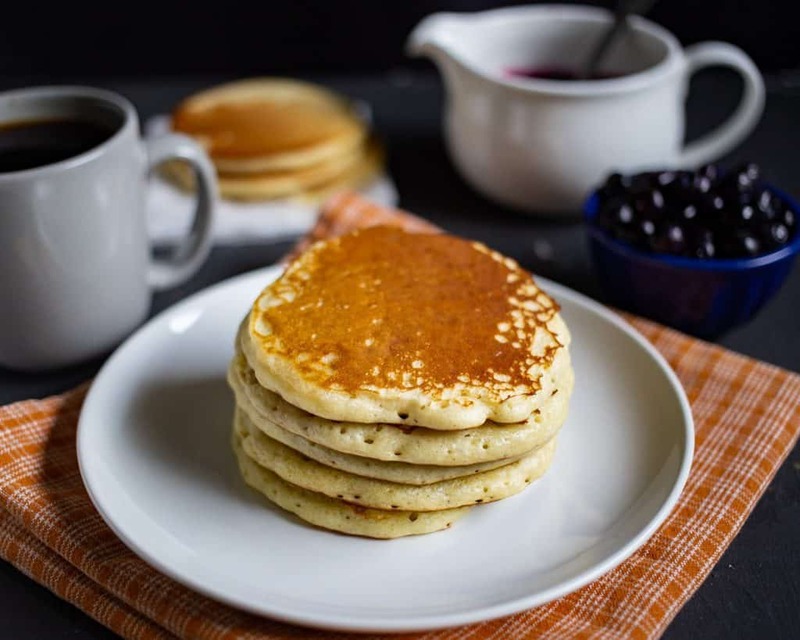 I rarely have buttermilk in my fridge, but sometimes want to make recipes like these pancakes without planning ahead. I’ve found that powdered buttermilk works just as well as fresh, and the powder can keep for months in your fridge. After mixing up your batter, heat the skillet with a little bit of butter. To test if the skillet is hot enough, sprinkle a few drops of water on it. If the water bubbles and jumps around, then it’s just right. My first batch of pancakes are always the worst – so don’t worry if they don’t look great until you get going, they’ll still taste great. 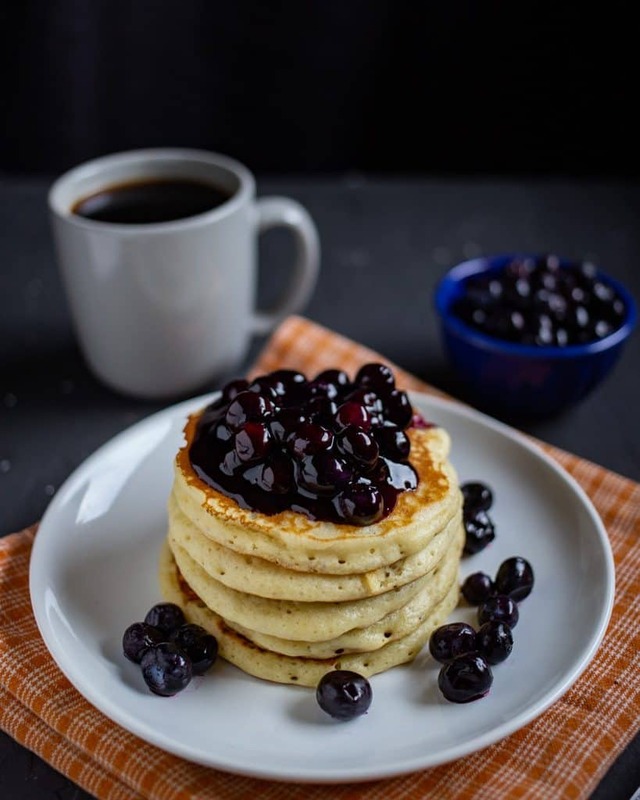 Serve the pancakes with the blueberry sauce. Or try a different topping – chocolate chips, Nutella, lemon and sugar, and maple syrup with butter are all wonderful. Or be adventurous and use a bit of Australian Vegemite – just make sure to spread it thinly. 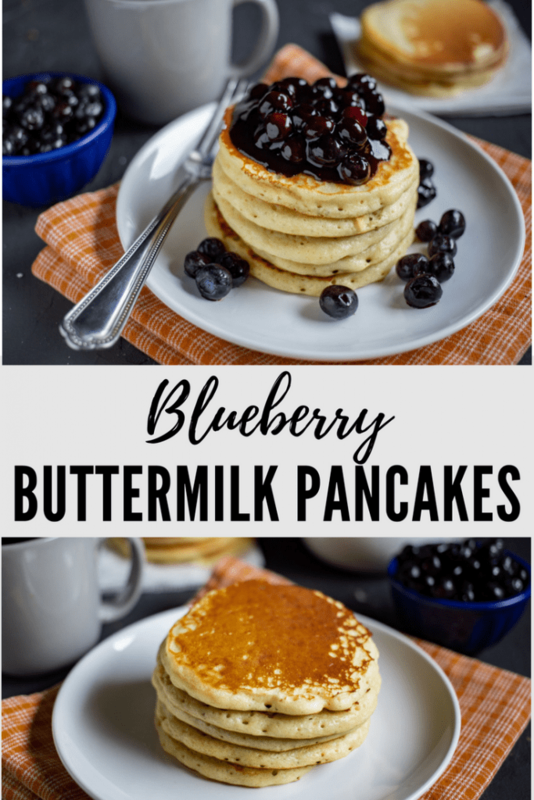 If you try these buttermilk pancakes with blueberry sauce leave a comment and review below if you try this to let me know what you think! Add half of the blueberries to a small pan along with the water and sugar. Heat over medium heat until the mixture comes to a boil. Add the dissolved cornstarch to the saucepan. When the mixture comes to a rolling boil, turn the heat down to low and simmer for 2-3 minutes. Turn off the heat but leave the saucepan on the burner. Add the remaining blueberries and stir gently. Serve when the blueberries have heated through, whether using fresh or frozen. Add flour, sugar, baking powder, baking soda, and salt to a medium bowl. Add the buttermilk powder if using. Gently mix with a fork. Stir in the egg and buttermilk or water. Heat large nonstick skillet or griddle over medium heat. Grease pan with small amount of butter. Pour just under 1/4 cup batter onto the hot skillet. Flip the pancakes when the bubbles have formed. Pancakes are done when they are golden brown. Those pancakes are pancake perfection. We love pancakes, too in our house, but I don’t make them often enough. Thank you for the inspo to get on it this weekend. My kids are big pancake fans and I am always looking for making a variety of pancakes for them. This recipe looks absolutely delicious. Such a beautiful meal to wake up to ! 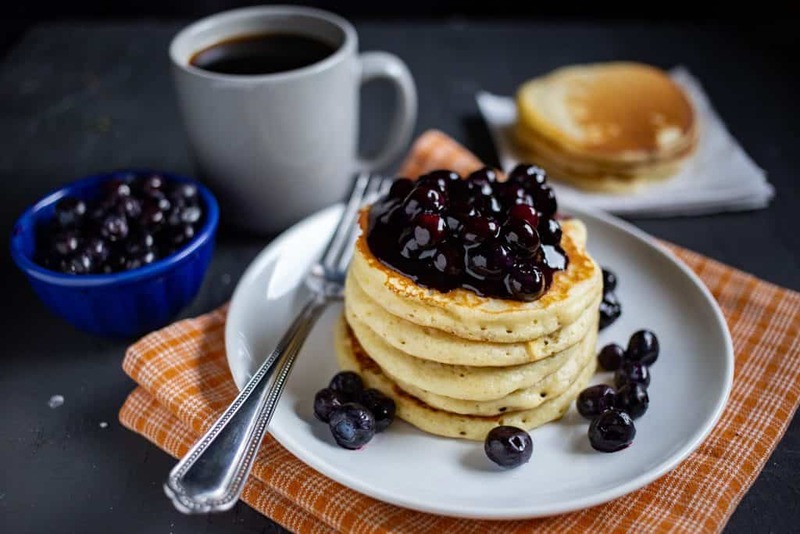 I s imply love homemade pancakes, and blueberry sauce is my favorite topping. Looks so delicious and perfect for Sunday brunch! What beautiful big fat pancakes I want to grab my fork and knife and dive right into that stack. That sheen on the bleberry sauce is incredible, what a wonderful sounding recipe this is!